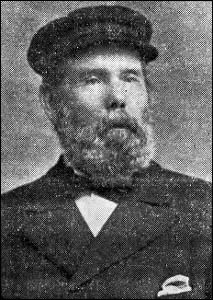 Born in 1820, Captain John Parry grew up in Llandudno and by the age of 26 was a Master Mariner – a career he continued for the next 32 years. Before the railway was constructed, ships were the only means of bringing in building materials to construct the new and fast-growing resort of Llandudno. Captain Parry’s first command was the Connivum, in which he brought the materials to build one of the town’s first hotels, The Mostyn Arms (now the Royal Hotel). He also shipped many of the blocks that were used to build Robert Stephenson’s tubular railway bridge at Conwy. In a lifetime at sea, Captain Parry witnessed some of the worst 19th-century shipping disasters to befall the North Wales coast. While sailing from Liverpool to Llandudno in August 1848, he saw the fire on board the American passenger ship Ocean Monarch which was en route to the USA from Liverpool. The fire killed 178 people, and burnt bodies washed up on local beaches for weeks afterwards. On the night of the 26 October 1859, a fierce storm blew up in the Irish Sea. Captin Parry anchored his ship with 12 others close to the Great Orme. Ten of the ships were lost to the sea, but Captain Parry through his able seamanship and knowledge of the coast was able to run his ship “under bare poles” to Conwy. That same evening the Royal Charter was wrecked off the Anglesey coast with the loss of 459 lives. In 1857 he became master of the General Havelock, which was funded and built by a syndicate of local men. He continued to convey building materials into Llandudno and on the return voyage took copper ore mined on the Great Orme. 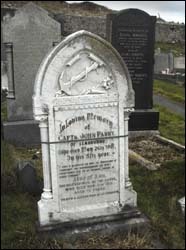 Captain Parry retired from the sea in 1878 but carried on working, operating a successful coal-merchant’s business until a few years before his death in 1907. Parry never sailed on a Sunday and was a deacon at the Tabernacle Welsh Baptist Church, where he was also a Sunday school teacher. Also buried here is his wife Ann, who died in 1911.